Christmas decor, as the popular catchphrase goes, are gifts that keep on giving. Some holiday pieces are so beautiful that it would be a shame to simply keep them in storage. Treetopia lets you in on a few tips on how to reuse Christmas decorations that you can display all year long. The delicate, comforting glow of Christmas lights look great any time of the year. 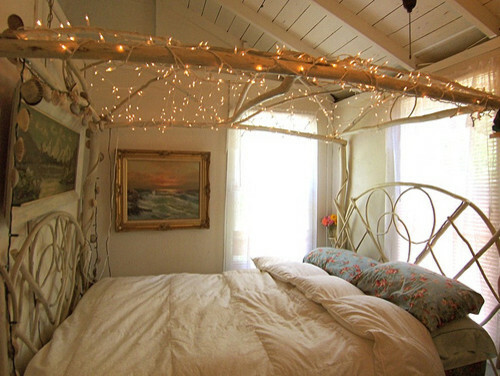 To make your bedroom feel warmer and cozier, hang strands of Christmas lights on your walls. You can also wrap them around your bed’s metal frame, or arrange them against the wall to form a bright faux headboard. For an even more dazzling touch, use holiday lights to outline your window frames and illuminate your mirror. If you have a garden, place strings of clear lights on the trees or potted plants that line the path to your front door. Mount clear or multi-colored Christmas lights on window sills and patio covers to keep your home’s façade looking fun and festive. Evening garden parties become more intimate and romantic by winding clear Christmas lights around tables and umbrellas then dimming strong outdoor lights. To make a simple yet elegant table centerpiece to accompany luncheons or dinners, gather Christmas ball ornaments of similar or complementary colors, and place them on a glass or silver bowl. Alternatively, you may place colorful ornaments in a glass jar or hurricane vase, and display them on the mantel, shelf, or coffee table. Short on ornaments but have plenty of burned out Christmas light bulbs? Here’s a wonderful tip from The Moody Fashionista. Simply coat each bulb in all-purpose glue, dip them in glitter, then use them as a vase or bowl filler. Rotate your selection of ornaments to match your mood, harmonize with your home décor, or reflect the changing colors of the seasons. Put old ball ornaments and fabric-based decor to good use in your kitchen with this clever suggestion from Young House Love. Simply secure strong magnets to these items with some heavy-duty construction adhesive to create attractive refrigerator magnets that hold inspiring images and important notes. It would be a shame to throw away all those beautiful paper holiday products. Used or excess gift wrapping paper can be used to line drawers and shelves to keep them looking cute and clean. Cut up old greeting cards and use them as fun gift tags for presents or name place cards for casual dinner parties. Get creative and feel the spirit of the holidays throughout the entire year with these decorating tips!